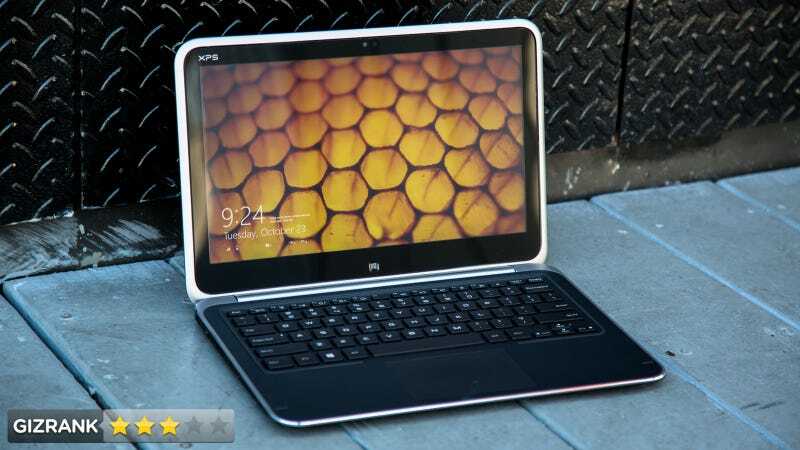 Among all the Windows 8 convertibles coming out, the Dell XPS is unique. Because it's insane. It's a full-on, regular laptop, with a trapeze artist screen that flips on an axis to convert into a slate. Is that something you'd actually want? Dell basically built an XPS ultrabook, only with a swiveling screen. That means a carbon fiber bottom and lid, a soft-touch interior, and an IPS screen. And a display that does backflips. At 12.5 inches, the XPS is a tweener—falling between the typical 11.6-inch and 13.3-inch models. It's a perfectly usable size as a laptop, and the slightly smaller screen sort of makes up for the XPS being a little thicker than a lot of ultrabooks. The XPS has the right idea, mostly. Using it feels like using a laptop. That's good. After spending enough time with a convertible, you notice that you really want it to do one thing really well—and you want the other options to be easy to ignore. While you can't ever really ignore the XPS's hinge (more on that in a bit), the laptop feels like a good XPS laptop—a top-notch, tappable keyboard with just the right spacing and travel distance; a gorgeous display with vibrant, accurate colors and a wide viewing angle. The touchscreen is extremely responsive, and gestures worked better on it than on other convertibles we've used. That said, using this thing as a tablet is not fun. To start, it's heavy! Even by x86 convertible standards, the XPS 12 is the least comfortable tablet to use, especially when working one-handed. The saving grace is that the rounded metal edges actually do make it comfortable to hold if you don't mind the weight (but that's a big, unlikely "if"). It's a shame, because its tablet-based software—gestures, accelerometer, touch response—is really great. The hinge design. The idea for a swinging hinge is a novel one, but it just doesn't work out in practical use. To start, opening and closing the lid—one of the most basic things you're going to be doing with a laptop—feels unsure. Any time you touch the display, you start to get tentative, since you don't want to swing the screen around. Even when you intend to flip it around, you worry that one push in the wrong direction will totally wreck your laptop. Also, being able to see through the spaces along the edges of the display (inside of the frame) is more distracting than you might think. The carbon fiber lid (as opposed to the aluminum of other XPS laptops) collects dust and dirt at a pretty annoying rate. In addition to ergonomics, the XPS suffers from the same issue facing most convertible x86 laptops—small text looks odd when formatted on such a large touchscreen while you're using it as a tablet. After being pretty excited about the XPS's trackpad drivers the first time we used it, the trackpad performance in the final product was pretty average. Not awful, but it frequently lost track of fingers and didn't recognize gestures. You have to be a very specific kind of computer user to really love this one. The XPS's main virtue is that it's a great laptop that you can use like a real laptop—along with an awesome, touchable display. • Dimensions: 8.4" x 12.5" x 0.8"